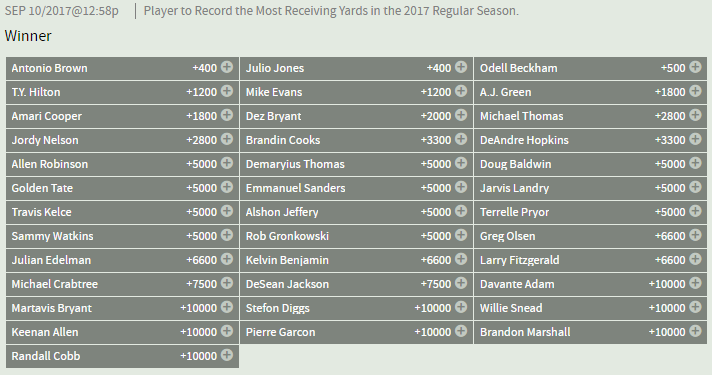 In our previous article, we brought you the odds on which quarterback would gain the most passing yards for the upcoming 2017 NFL season. We now turn our attention to their targets – the Wide Receivers. Despite missing two games last season, Julio Jones of the Atlanta Falcons nearly led the NFL in receiving yards for the second year in a row. He finished second behind T.Y. Hilton (1,448) of the Indianapolis Colts with 1,409 yards in 2016, but he is listed as a +400 co-favorite to regain the title in 2017 along with Antonio Brown (1,284) of the Pittsburgh Steelers. Brown had the most receiving yards in 2015. Ironically, Hilton, Jones and Brown are the only three active players who have led the NFL in receiving yards. Hilton turned in his best season as a pro last year as quarterback Andrew Luck’s top target, catching a career-high 91 receptions and scoring six touchdowns – tying him for 10th in catches and yards per catch. Jones was bothered by a toe injury last year but still managed to average more yards per game than any other receiver (100.6) – besting Hilton (90.5) by a wide margin. A.J. Green of the Cincinnati Bengals ranked second in the league in yards per game (96.4), although he missed six games due to injuries and finished with a career-low 964 yards. Green has surprisingly never won the title in his previous six seasons, and he is listed at +1800 this year. Hilton and Mike Evans (1,321) of the Tampa Bay Buccaneers are both tied as the fourth choice on the betting board at +1200 behind Odell Beckham Jr. (1,367) of the New York Giants at +500. The projected numbers for Beckham and Evans might take a bit of a dive this year considering each of their teams brought in veterans this offseason to help take some pressure off them. In New York, Brandon Marshall moves from the Jets to the Giants, and he has produced career-best numbers in the first season with each of his previous two teams, including a career-high and franchise-record 1,508 for the Chicago Bears in 2012. Meanwhile, Tampa Bay picked up the speedy DeSean Jackson, and he tied with Chris Hogan of the New England Patriots for an NFL-best 17.9 yards per catch in 2016. Jackson is a +7500 longshot to lead the league in receiving while Marshall is +10000. Odds as of July 18th, 2017. Check back with Bovada for the latest odds.